The past week I had some decent fishing from Key Biscayne Tarpon, Government Cut and of course Flamingo. I also just got back from a 3 day trip with my Miami Sportfishing Club on the new house boats at Flamingo Marina. I fished with guys I had not fished with in years and just enjoyed watching them catch fish. I also enjoyed showing them how its done! We set up shop right on the dock and didn’t take the boats up into Whitewater Bay like we had done in the past. The boats are slow and it with the time frame and the amenities you have them its more practical to stay at marina. I fished with my buddy Danny Varona on the trip its been 15 years since we fished together. Danny has built my web sites since I started guiding. We got out Friday morning and it didn’t take long and we caught 30 Redfish, a bunch of Snook and a couple Trout. It was cool and Tarpon which were the target for the weekend weren’t around. I did the next best thing and went Snook fishing. We caught allot of Snook and Danny who is a great fly caster caught some on fly which made his weekend for Now! 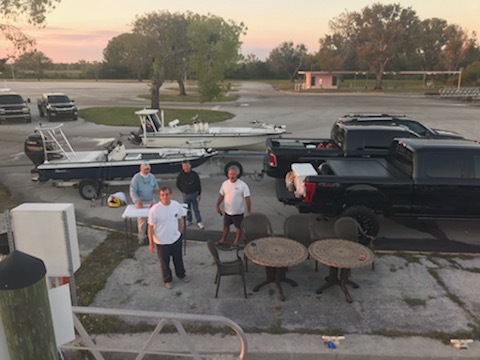 We came in around 3 waited for everyone to get there set up houseboat and had a great BBQ which was done by Eric Castillo of Sea Vee , giants Steaks and chicken wing appetizer’s. The were a few assorted bottles of choice alcohols and we talked about things that happed in the club over the last 30 years, Guys have moved and we see each other on Facebook post but it was a great time The Miami Sportfishing Club is one of the oldest clubs in South Florida and we refused to let it go away, its been part of my life since 1985. Most of my fishing friends have come thru there. We are planning for next years trip which we hope to rent all 4 houseboats and have one heck of a outing. I did fish with other people last week and since but this was in the works for a few months and I was still excited about it. I ran around all day with my buddies Nate Ramasinni and Eric, Nate wanted to run way north so we did. We caught plenty of fish and had a good time doing it. It was fun fishing and watching my buddies catch lots of Snook. We made it back around 5 pm and had another great BBQ by Eric. The weather was perfect no bugs to speak of. This was an incredible trip, the Miami Sportfishing Club used to do this every year but the house boats weren’t very good so we quite. The new houseboats are great and we are making plans for next year, we expect to rent all 4. I fished with my clients and great friends ross and Mindy and had a great day. Ross got a nice Snook and then Mindy followed him with one. The spot that had been holding Snook was full of decent Trout today, they don’t care they just keep catching them. We ran the traps and caught a few nice Triple Tails. We had an enjoyable day and caught 10 different species. The fishing is outstanding right now I have some weekends open right now in April give me a call at 305 333 8149. Its spring break so bring your kids fishing!